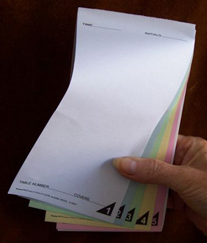 5+ ply Self-Carbonating/NCR order pads all come with a thick board back and attached fold-over rigid heavy weight writing shield which is scored twice for ease of use. 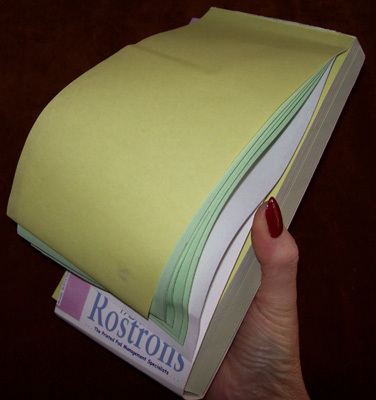 All Rostrons order pads are double glued with linen binding or wire stitched and made using NCR Self Carbonating paper - NOT old fashioned sheets of carbon paper. Description: Self-Carbonating/NCR, 5 Ply Sets. Pad Wording: Time, Initials, Table Number, Covers. Description: Self-Carbonating/NCR, 6 Ply Sets.